With a deep feeling of concern, I, as a member of the Indigenous People of Biafra, your brothers and sisters, kit and kin, and kindred, write to you over your nomination as the Vice-Presidential candidate of the People's Democratic Party. Since your nomination by Atiku as his running mate, we have been left in a quagmire of opinions, as the timing of your nomination is both odd and inimical, considering our collective struggle at present, and our resolve not to vote again in the charade that Nigeria calls elections. We are not unaware of the agenda of using your nomination to cause disaffection and disunity amongst us in our struggle for restoration of our dear nation, Biafra. In as much as the idea of picking you as vice presidential candidate under PDP at this time is not obscure, it can be said to be obsolete, considering the fact that the Eastern region (Biafra) had been sidelined in the politics of Nigeria in the so-called zoning system of the presidential slot. We are neither at crossroads, nor in doubt about whether we will back down on our struggle for restoration of Biafra. We are not in doubt that this is the main, if not the only reason for nominating you, an Igbo man at this moment for such a post. Your nomination is hatched to foil our imminent freedom. We can confidently tell you, though regrettably, that your nomination has more ulterior motives than good to our collective struggle because this should have occurred perhaps many times before now since 1970. This is about the only time a Biafran is unopposedly and undebatedly nominated for the post of VP since the suspension of the genocide in 1970, which they like to call civil war; a case brought about certainly by the unprecedented intensified effort of Nnamdi Kanu to restore Biafra. We feel the pains on your behalf because we would have used this opportunity to prove beyond doubts that Igbo love themselves against the divisive and devilish mantra that Igbo hate themselves and are not united, as fondly propagated by the outposts of the mendacious BBC called Oluwole Lagos Ibadan expressway brown envelope gutter media. Had it not come now that we are about to have our freedom, had it been the nomination were not laden ulteriorly with more enslavement than emancipation, had it been the caliphate had not designed you to be a bait, had it been that the British Rogueyalty had not meant to use you to balkanize Biafrans and shatter our synergy, you would not solicit for our votes before you have them. We love you, for we love ourselves, but we love our freedom more. We love you, for you're our father, brother and son, but for our imminent freedom, the freedom of Biafra nation you will certainly not have our support and votes because we have covenanted to boycott everything that has the semblance of election in the British inhumanity called Nigeria. The freedom of Biafra is sacrosanct and superior to the VP slot that our oppressors have decided to placate us with, for more enslavement. 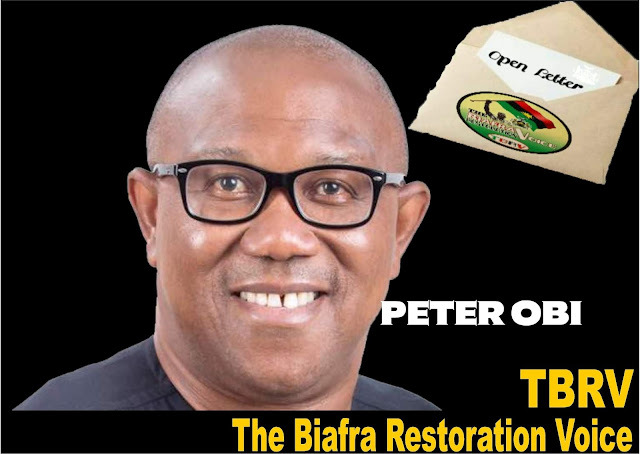 Let it be known to you that it is a collective decision of the people, the entire people of Biafra, to boycott the 2019 general election, to prove our dissatisfaction and hate for our union with Nigeria, and to make the international bodies responsible for dismemberment of nations or part of a nation that is no longer interested in continuing in unity with others to see and do the needful. It's not the decision of a group, as wrongly purported. We have no issue with you as a person. But for our freedom we have taken this position that will certainly disappoint you. Religious leaders, eastern governors, community leaders, undoubtedly must have promised you our votes. They must have assured you of victory coming from our support. Alas, they are hallucinating, only trying to cash in on your desperation for power. Atiku, for a truth has no iota of empathy for Biafra. They themselves will not even come out to vote for you on the election day. Those, though very few of them, from Biafraland still supporting election and one-Nigeria are the beneficiaries of the criminal status quo or are mere political job hunters whose aim is nothing but to ride on the false love and support for you to prey on you in the of guise of supporting you or/and to canvass support and votes for you. Let it be known to you that you are on your own, as far as this election is concerned. In a nutshell, we the people, your people, the Indigenous People of Biafra have decided to remain united for our total freedom from Nigeria. We're tired of being one with a country that despises us, neglects and relegates us to dustbin only to be remembered again whenever election is by the corner. We can't be deceived again. We can't be deceived with VP slot, when our total freedom is at verge of materializing. What is coming is bigger than the position you are vying for. Biafra is bigger than the VP slot. In Biafra we shall have freedom, equity, justice and peace. We will control our resources, create jobs, develop our land, open our seaports and airports, open our closed factories, secure our lives and properties by ourselves against external aggression, as typified by Boko Haram and herdsmen menace. The aforementioned cannot be possible under the current criminal and slavish document called constitution. You can attest to the fact that the current VP, Osinbajo is as silent as he is non-existent. What makes you think that your own case will be different, under the same Fulani proxy of the exploitative Britain? You may be oblivious of the fact that restructuring won't happen, even if by happenstance you make it, given the political configuration of the senate and house of representatives. Or are you part of the game plan to use the mantra to ride to power? We therefore, ahead of time, register our unsupported intention for your VP bid until Biafra comes. To all Biafrans, we encourage you to heed to election boycott for our freedom is near. Do not be deceived with whatever offer to vote during the election. Your vote for any candidate is an endorsement and validation for your suffering, poverty, unemployment, insecurity and death. Remain resolute for our freedom is imminent.